Armstrong was the Sports in Kansas Non-Senior Player of the Year last year and followed that up with another outstanding season to take home top offensive player of the year honors from Sports in Kansas. Armstrong was a three-time all-state selection for the three time state champion Stags and had 45 career touchdown receptions which is now a state record in Kansas. The Mizzou commit had 3,744 yards receiving on 172 catches in his career. Maffry was the Sports in Kansas Non-Senior Player of the Year last season after racking up over 170 tackles as a junior and had an even bigger year in 2016 for the 6A state runner-up Tigers. Maffry, a two-time all-state selection, had 183 tackles and three interceptions over his senior year. It’s not often an offensive lineman earns player of the year honors, but Rivas was the most valuable 6A offensive player to his team this season. He helped the Salthawks to over 350 yards rushing per game this season, while leading the team to an 8-2 record, both losses coming to 6A state champion Derby. The Kansas State commit stands 6-foot-6 and weighs 335 pounds and is one of the more dominating lineman we’ve seen over the last few seasons. Murray was arguably the best high school quarterback in Kansas this season and led Great Bend into the semifinals for the first time since 2006. He passed for 2,281 yards with 23 touchdowns through the air, while rushing for 1,317 more with 26 more touchdowns. 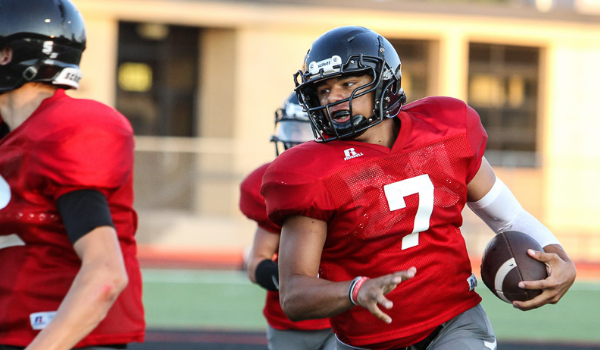 Murray accounted for 82 total touchdowns as the Great Bend quarterback in his career. Donn was lights out from his safety position this season for the back-to-back state champion Jaguars. Donn ranked number one in 5A this season with 195 tackles, including 18 and an interception in the title game win over Goddard. Donn had three total interceptions this season and 12 of his tackles went for loss. Usher-Pearson was one of the most dominating lineman in Kansas over the last two seasons. He has earned back-to-back all-state seasons in 4A-I for the Bulldogs. The 6-foot-1, 265-pound, senior, was the Southeast Kansas League Defensive Player of the Year in 2016 and also the Southeast Kansas All-Area Player of the Year this season. Mlekus rushed for over 1,000 and passed for over 1,000 for the Raiders this season on the way to a 10-1 record. He received first team all-state quarterback honors in 4A-II from every major publication in Kansas this season. The senior dual threat quarterback accounted for over 4,500 yards of career offense with 59 total touchdowns and proved to be one of the best quarterbacks in the entire state, regardless of classification. He is also a 4A all-state wrestler and will compete at 170 pounds this season. Williams is a back-to-back all-state selection and earned Sports in Kansas 4A-II Defensive Player of the Year honors last season. He helped the Longhorns to a 10-2 record this season, only losses coming to the eventual state champion Pratt. Williams had over 500 career tackles at Holcomb from his linebacker position. Williams also rushed for over 1,000 yards on offense. Bradshaw, a first year senior starter at the quarterback position, had some huge shoes to fill in replacing three-time all-state selection Tucker Horak, and he exceeded expectations in leading the Dawgs to their third consecutive state title in 3A. Bradshaw led the state in rushing with 2,734 yards rushing and passed for another 1,774, while accounting for 56 total touchdowns. He was a first team all-state selection by every major publication in Kansas this season. Urban was one of the most powerful and dominating players in Kansas. Standing at 6-foot-1, 270-pounds, it’s not often you see an all-state offensive lineman also be an all-state linebacker. Urban patrolled the middle for the Cardinals this year and led them to a 12-1 record this season, before losing to eventual 3A state runner-up Hesston. Urban had over 100 solo tackles from his linebacker position and helped lead one of the best offensive lines in the state this season, also earning all-state honors at that position from every major publication. Huss was one of the most versatile players in the smaller classifications of Kansas. There’s not much the senior all-state selection couldn’t do. He had 2,809 yards of career receiving, 1,142 career rushing, 168 total tackles, 18 interceptions and 61 total touchdowns. The three sport all-state athlete most important possession is a 2-1A state title this season. Huss was named to every major publication first team all-state team this season, including Top 11 selections from the Wichita Eagle and Topeka-Capital Journal, the first player in Troy history to be named to those lists. Huss was also the 2-1A Offensive Player of the Year last season at Sports in Kansas. Friend, like Huss above, was also one of the most versatile players in Kansas. Also a top quarterback in 2-1A, Friend had an outstanding season at defensive back for the 2-1A state runner-up Cardinals. He picked off six passes from his defensive back spot this season. Friend had over 3,300 yards on offense this season at the quarterback position. In addition to being a quarterback and defensive back, he also served as the team’s kicker, punter, and return man on special teams. Grbast did a little of everything for the 8M-I state champion this season. He had 1,608 yards rushing with 32 total touchdowns, passed for over 272 more with eight touchdowns, and had 212 receiving yards with two more scores. He also had over 70 tackles and picked off seven passes on defense. Whether he was playing QB, RB or on defense, Grbast was the top threat in 8M-I this season. Rogers picked off nine passes on defense this season for the 8M-I runner-up Indians, He also had over 1,000 yards rushing on offense and another 500 yards receiving. He was one of the most versatile players in 8M-I this season. After a record breaking season one year ago, Will Bruna was a repeat selection to being a Sports in Kansas Player of the Year this season, but this time it’s in 8M-II instead of 8M-I like last season. Bruna passed for 5,397 yards in his career with 90 total touchdowns in just two years as a starter. He also rushed for 1,504 and 37 more scores. His 2,300 combined yards with 42 total touchdowns this season helped lead the Wildcats to the 8M-II state title, a year after taking second in 8M-I. His 56 touchdown passes last season are a Kansas state record for single season. Not only was Foos the top receiver in 8M-II this season, he was one of the best all-around player’s in both of the 8-man classifications. He has 108 tackles with four interceptions on defense and accounted for over 2,300 yards of total offense this season, including over 1,300 receiving with 28 touchdowns. Foos helped the Hornets to a runner-up finish in 8M-II this season. Offense: Tucker Horak, Rossville, QB Sr.
Defense: Amani Bledsoe, Lawrence, DE Sr. Offense: J.D. Woods, Lawrence, RB Sr. Offense: Christian Jegen, Mill Valley, WR Sr.
Defense: Cole Morris, Mill Valley, DE/OLB Sr. Offense: Dawson Downing, Bishop Miege, RB Sr.
Defense: Ian Rudzik, Ulysses, LB Sr. Offense: Jace McDown, Columbus, RB Sr.
Defense: Dillon Williams, Holcomb, LB Jr.
Defense: Cooper Griffith, Scott City, LB Sr. Offense: Cuttar Huss, Troy, WR Jr.
Defense: Kash Larabee, Meade, LB Sr. Offense: Will Bruna, Hanover, QB Jr.
Defense: Isaiahh Loudermilk, West Elk, DE/LB Sr. Offense: Ryan Willis, Bishop Miege, QB Sr.
Defense: Kyle Ball, SM East, DE Sr. Offense: Blaik Middleton, Hutchinson, RB Sr.
Co-Offense: Alex Barnes, Pittsburg, RB Sr.
Co-Offense: Denzel Goolsby, Bishop Carroll, RB, Sr.
Defense: Dejuan Gardenhire, Shawnee Heights, LB Sr.
Defense: Colton Beebe, Piper, LB Sr. Offense: Drake Hake, Concordia, RB Sr.
Defense: Darric Cashier, Santa Fe Trail, LB Sr. Offense: Tucker Horak, Rossville, QB Jr.
Defense: Levi Wyrick, Caney Valley, DL Sr. Offense: Tristan Speer, Troy, QB Sr.
Defense: Sheldon Schmidt, La Crosse, DL Sr. Offense: Layne Bieberle, Central Plains, WR Sr.
Defense: Brandt Wolters, Osborne, LB Sr.
Co-Offense: Cannon Burns, Fairfield, RB Sr. Offense: Trae Wrench, Gardner-Edgerton, RB Sr.
Defense: Peyton Newell, Hiawatha, DL Sr. Offense: Trae Wrench, Gardner Edgerton, RB Sr.
Defense: Jose Delgado, Derby, LB Sr. Offense: Ryan Ralston, BV West, QB Sr.
Defense: Brad Ivey, Miege, LB Sr. Offense: Riley Allen, Buhler, RB Sr.
Defense: Elijah Jones, Coffeyville, LB Sr. Offense: Dailin Kruger, Silver Lake, QB Sr. Offense: J.T. Rosine, Centralia, QB Sr. Offense: Trever Powell, Kiowa County, RB Sr.
Defense: Kenton Ubelaker, Osborne, DB Sr. Offense: Dustin Rottinghaus, Baileyville B&B, QB Sr.
Co-Defense: Dalton Walker, Wallace County, DL Sr.
Co-Defense: Derek Mueting, Baileyville B&B, LB Jr. Offense: Zeke Palmer, Bishop Carroll, QB Sr.
Defense: Will Geary, Topeka, DT Sr. Offense: Brad Strauss, Lawrence, QB Sr.
Defense: Zack Befort, Bishop Carroll, DL Sr. Offense: Alex Evans, Mulvane, WR Sr.
Defense: Trent Tanking, Holton, LB Sr. Offense: Tanner Wood, Conway Springs, APB Sr.
Defense: Drew Kite, Scott City, LB Sr. Offense: Trevin Wiens, Meade, RB Sr.
Defense: Kip Keeley, LaCrosse, LB Sr.
Co-Offense: Dalton Gantz, Ness City, RB Sr.
Co-Offense: Matt McClaren, Minneola, RB Sr.
Defense: Garret Flax, Ness City, LB/Ret, Sr. Offense: Dylan Wissman, Otis-Bison, RB/Ret Sr.
Defense: Kyle Hammond, Crest, LB Sr.